INCHEON, Oct. 19 (Yonhap) — Philadelphia Phillies’ South Korean outfielder Kim Hyun-soo returned home Thursday after what he called a “disappointing” second season in Major League Baseball (MLB). Kim batted .231 with home runs in 14 games out of 96 games split with the Baltimore Orioles and then the Phillies. The 29-year-old only had 239 plate appearances, as he was relegated to the bench role behind younger and more athletic outfielders on both teams. He failed to build on a promising rookie season with the O’s when he batted .302 in 95 games and had a solid on-base percentage of .382. The two-year deal that he’d signed with the Orioles in December 2015 has expired. The Orioles opened the season with an abundance of outfield assets, and they converted hot-hitting rookie first baseman Trey Mancini into an outfielder to keep his bat in the lineup. Kim was hitting just .232 with a .305 on-base percentage in 56 games when the Orioles dealt him to the Phillies on July 28 for right-hander Jeremy Hellickson. The South Korean then batted .230 in 40 games with his new club the rest of the season. On a rebuilding Phillies club stacked with young outfield talent, Kim was an odd man out and is unlikely to be retained after his two-year deal ran out after the season. 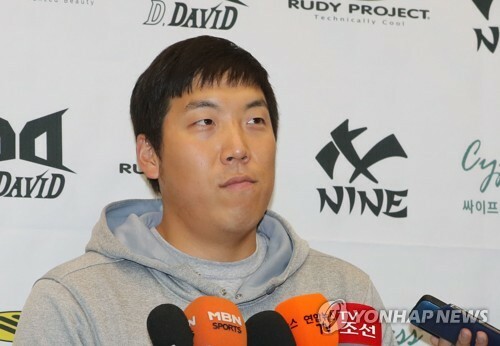 Kim, who spent the first 10 years of his professional career with the Doosan Bears in the Korea Baseball Organization (KBO), inked a two-year deal for US$7 million as a free agent with the Orioles in December 2015. He’s going to be a free agent again this winter, and Kim said he’ll let his agent take care of the business side of baseball. Whether he’d be willing to take on a split contract — which offers different salary rates for time spent in the majors and the minors — Kim said he’d have to look at the rosters of teams that show interest in him. Kim said the Orioles told him about the trade at the last minute, and he barely had time to say good-byes to his teammates. Kim said he felt comfortable in Philadelphia and said the coaches and new teammates took good care of him. He may not have performed well. However, this is true that he always have proved himself a good challenger and for sure, he will come back after making things good for him.